110g animal novelties, including cats dogs and a mouse. 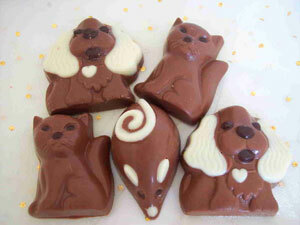 Milk chocolate selection of hand-made animal novelties decorated with white chocolate. Example shows two cats, two dogs and a mouse. Items may vary.